In the early hours of 21st August 1942 a Vickers Wellington bomber and an Airspeed Oxford trainer were involved in a mid-air collision North-West of Chipping Norton over open country. The Oxford was on a pilot training flight from No 6 Advanced Flying Unit, Little Rissington, whilst the Wellington was on a crew night training flight from No 15 Operational Training Unit based at Harwell. Both aircraft were destroyed by the impact. The Oxford disintegrated in mid-air, the main wreckage falling into a cornfield in Colt's Farm, Over Norton, the bodies of the two crew members being found nearby. The Wellington lost its entire starboard wing and engine and caught fire immediately. shedding burning wreckage it glided down, skimming rooftops before finally crashing into what is now Redrobe Cottage in Church Street. The nose was touching the side of the house and the tail rested across the garage roof and adjoining walls. This was the only portion to remain intact. The crew of 6 were killed. the aircraft was not carrying any bombs but ammunition from the 4 Vickers machine guns exploded for some considerable time. The fire was extinguished with chemical foam by the Chipping Norton Fire Brigade assisted by fire crews from the local airfield. The remains of the aircrew were recovered and taken to the mortuary at the Workhouse, now Cotshill. Miraculously there were no civilian casualties, despite the aircraft crashing in a confined space. No cause for the accident could be confirmed, but it was probably due to the darkness of the night, absence of radar, still in early stages of development on board aircraft at the time, and the wartime blackout meant no navigation lights were switched on. Whilst Oxford Trainers were generally painted yellow, many of the Wellingtons used in the training role had seen service as night-bombers and their undersides were painted matt-black to make them a harder target for enemy night fighters. The Airspeed AS.10 Oxford was a twin-engine aircraft used for training aircrews in navigation, radio-operating, bombing and gunnery during the Second World. With a normal crew of three the seating could be changed to suit the training role. The cockpit had dual controls and two seats for a pilot and either a navigator or second pilot. The aircraft could be used for training navigators, bomb-aimers, wireless operators, air gunners and camera operators. The Oxford could also be used as an Air Ambulance. The Vickers Wellington was a twin-engined long range medium bomber designed at Brooklands in Surrey by Vickers-Armstrong's chief designer R.K. Pierson. 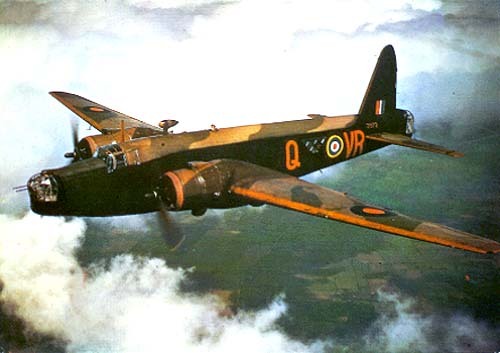 It was the mainstay of Bomber Command's World War two night force until the arrival of the four-engined "heavies" such as the Avro Lancaster.It was the only British bomber to be produced for the entire duration of the war. It served in all theatres of war in anti-submarine, torpedo bombing, mine clearance and training roles. It was well liked by its crews who nicknamed it "Wimpy" after the character in the Popeye cartoons "J. Wellington Wimpy". 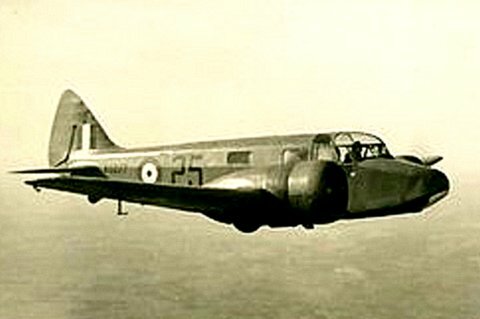 The Wellington used a geodesic construction method devised by Barnes Wallis and previously used on airships and the single-engined Vickers Wellesley bomber. This gave the fuselage great strength and as the skin was made of Irish linen coated with many layers of "dope" it was lightweight for its size. It could stand a great deal of punishment and many aircraft returned home with the fabric torn away and the geodesic skeleton revealed. SERGEANT STANLEY EDMUND DOWNS, RAFVR, PILOT AGED 21. He was the son of Arthur William and Gladys Downs of Southall and is buried in Havelock Cemetery, Southall, Middlesex. SERGEANT JOHN MacDONALD RANKIN, RAAF AGED 25, PUPIL PILOT. He was the son of Donald Stephen and Ruby Augusta Rankin, of Longueville, New South St Wales, Australia and is buried at Little Rissington in St Peter Churchyard. PILOT OFFICER ALBERT WYNDHAM STILWELL , RAFVR, AGED 21 1st PILOT. He was the son of AA and Florence Stillwell and husband of Elsie Stillwell of Hoath Park, Cardiff and is buried in Cathays Cemetery, Cardiff. PILOT OFFICER ALAN MacDONALD HENDERSON, RAFVR, AGED 30 2nd PILOT. He was the eldest son of Major Ian Macdonald Henderson and Kathleen Mary Henderson of Woking, Surrey. He was at Charterhouse 1926 – 1929 and worked for Dennis Bros in Guildford. He served as a Lieutenant in the London Scottish until 1941, before transferring to the RAFVR to train as a pilot. He is buried in St Peter's Churcyard, Little Rissington. SERGEANT MALCOLM STEVENSON HAYNES, RAFVR, AGED 21, WOP/AIR GUNNER. He was the son of Evan and Elizabeth Haynes of Whitchurch, Glamorgan and is buried in St Peter's Churchyard, Little Rissington. SERGEANT NOEL FRANCIS BOXWELL, RAFVR, AGED 19, WOP/AIR GUNNER. He was the son of Ambrose and Margaret Boxwell of Dublin and is buried in Drumcondra St George's Burial Ground, County Dublin. 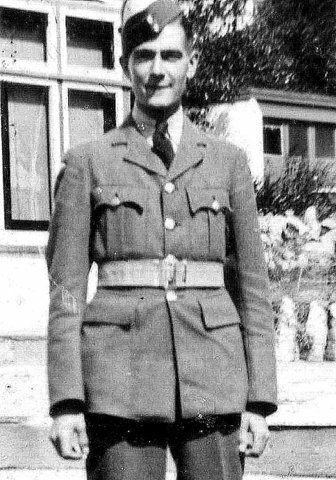 SERGEANT PATRICK O'BRIEN, RAFVR, AGED 27, OBSERVER. He was the son of James and Rose O'Brien of Uddingston, Lanarkshire. He had a MA honours degree and is buried in Brookwood Military Cemetery in Surrey. SERGEANT FRANK GILLARD, RAFVR, AGED 20, AIR GUNNER. He was the son of James and Lily Gillard of Hinderwell, Yorkshire and is buried in the churchyard there. "Stan was my big brother , unfortunately - on two counts - he was nearly 9 years older than me, which for one meant he was old enough to serve and die for his country (aged 21) as a pilot during World War II and secondly it meant that I perhaps wasn't as close to him then as I would have been had he lived ; as when you are only 7 or 8 years old , that 9 year gap is much wider than it would have been had I been 20 or 30 . However he wasn’t “alone” growing up as he was close in age to my big sister Eve and they were an inseparable pair , as I was with my younger brother Alan.My one abiding memory was of Stan and one or more of his friends setting off to cycle on his racing bike all the way to Lands End , no mean feat in those pre-motorway days , I can’t remember how long he was gone , but I do remember my Mothers reaction on his return , looking like a tramp having run out of money and been sleeping rough for goodness knows how many nights - he was in the doghouse for some time ! As I have said , he was called up in the June of 1941 , joining the RAF where - because of his academic ability he was taught to fly , and I remember how proud both he , and the rest of my family were , when he was awarded his wings and became 1385092 Sergeant Pilot Stanley Edmund Downs . However that’s when the worrying really starts , knowing that he would have to serve a tour of duty , flying his bomber deep over enemy territory , predominately at night , having to complete 30 separate missions . Imagine what it was like for us and thousands of other families with loved ones serving in the forces , looking for the telegram boy walking down the road , praying he’s not going to come to your door , experiencing that sense of relief when it’s not you , but knowing that some other poor family are going to get the dreaded knock on the door . Stan , however to our great relief completed his tour safely and was posted to the No. 6 (Pilots) Advanced Flying Unit , based at Little Rissington in Oxfordshire . He was due home on leave at the weekend of Saturday the 22nd of August , but at 0505 hours on the morning of Friday August the 21st he took off on a training exercise in an Oxford Mark II serial no. T1339 with his pupil Sergeant J McDonald Rankin of the RAAF , shortly afterwards they were in collision with a Wellington serial no. T2557 which was also on a cross country training exercise . The Wellington broke up and crashed on the outskirts of Chipping Norton and my brothers plane crashed onto the land of Cotts farm Over Norton about a mile away , tragically there were no survivors , my brother , his pupil and the six crew of the Wellington all perished . Later that day the knock came at the door and I believe my Mother half expected it to be Stan home on leave early , but this time the telegram boy was stood at our door . Following recent research into our family tree in general and Stan in particular, we have taken great comfort on discovering that the good people of Chipping Norton saw fit to commemorate this tragic loss of life with a plaque , situated on Church Street , remembering the names of those who lost their lives in this incident." "The Oxford disintegrated near Over Norton. The Wellington flew on, on fire, shed the starboard wing over the Castle Mound which made it fly on a left hand circle over the town, losing height until it finally came to rest just short of what is now called Red Robe House (then known as Yew Dell) The occupants of the house, my mother, sister and self plus a family lodging with us called Bainger - he was from Southampton and worked in a munitions factory in the town - miraculously escaped through the kitchen window into Church Street as the garden was a blazing inferno. "I saw the crash happening on that day, I lived in Shere, Over Norton Rd at that time and was 11 years old. My bedroom was at the rear of the house overlooking what were then fields! I was awoken by a tremendous noise and rushed to the window to see a plane on fire falling towards the church and landing with another crash. I of course know where it fell, on the Doctor's house not the church! I also thought I saw something else falling in the field below what was at that time farm buildings belonging to Mr Warmington one of our local butchers. My father a member of the Heavy Rescue org, a volunteer got up and went down to the crash site. I was of course ordered to stay in bed! The next morning in daylight I could see plane wreckage in the field mentioned. I now know of course that the plane on fire was the Wellington and the plane in the field was the Oxford. I saw both sites during the day and walked over to the plane in the field and was told by personnel at the site to go away! Thought you might like to hear of me seeing it all. I had not remembered the crash until seeing your mention in the paper. During his holidays from school, Mr J D Mawson was staying as a guest in, what was then, the original vicarage across the road from Redrobe House. Like everyone else within earshot he was awakened around 4 am by the noise of the crash. Looking out of the window as the aircraft passed very low overhead, he saw burning wreckage dropping in a line which straddled the house. Seconds later the plane finally crashed just across the road. Feeling that the fiftieth anniversary would be an appropriate time to commemorate this event, Mr Mawson started to make enquiries in 1986, contacting the RAF Air Historical Branch in London and the local Coroner to find the details and receiving accounts from local residents.The plaque was created in stove-enamelled cast aluminium by Ward Signs of Barton Hill, Bristol. It was unveiled on the 20th September 1992 by Wing Commander L V Dale (rtd) in the presence of the Mayor of Chipping Norton, and representatives from RAF Little Rissington. The plaque was dedicated by the Vicar of Chipping Norton Parish Church. A contingent of Air Cadets from 136 Squadron ATC were also present and provided a bugler to sound The Last Post and Reveille. 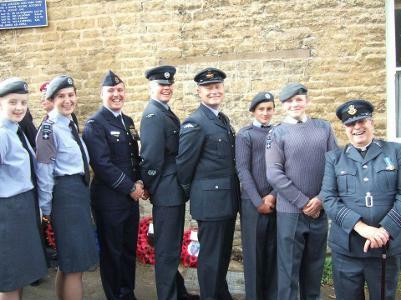 Over 100 people gathered at St Mary’s Parish Church in Chipping Norton to mark the 70th Anniversary of the mid-air collision over the town of a Vickers Wellington Bomber and an Oxford Airspeed Trainer in which 8 aircrew lost their lives. In a short but moving ceremony, organised by the branch, the story of the incident was read by John Grantham, accounts of eyewitnesses by Alec Corfield and Linda de Silva, from The Crown & Cushion, and the poem “High Flight” recited by Steve Kingsford. The service was conducted by the Vicar of St Mary's Canon Stephen Weston with prayers from Canon Robin Howard and a reading from Isaiah 40 by Rev Bernard Rumbold RAF rtd, a blessing and hymns. Fittingly the final hymn was “God is my strength and refuge” to the tune of the “Dambusters”. The memorial was attended, amongst others, by a contingent of serving airmen from RAF Brize Norton lead by Squadron Leader David Marsh. The Royal Australian Air Force was represented by Flight Lt. William Harwood RAAF who subsequently laid a wreath on the grave of Sergeant Rankin at Little Rissington war cemetery. After the service the congregation proceeded to the blue memorial plaque in Church Street for the laying of wreaths followed by a blessing, the Last Post, a minutes silence, Reveille and the Kohima exhortation. Wreaths were laid by the Deputy Lord Lieutenant of Oxfordshire on behalf of Her Majesty the Queen, the Mayor of Chipping Norton, Squadron Leader Dave Marsh on behalf of the RAF, Flight Lieutenant Will Harwood of the Royal Australian Air Force and representatives of the Thames Valley Police, Royal British Legion Chipping Norton Branch and Ladies Section and 136 Squadron Air Cadets. Refreshments were then taken at the Crown and Cushion Hotel. In the afternoon a party went to St Peter’s Church in Little Rissington where three of the airman lay at rest along with 46 other airman from Great Britain and the Empire in an immaculately kept churchyard in beautiful surroundings. 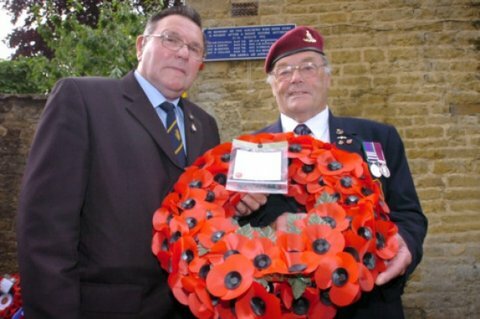 Wreaths were laid on the graves of John Rankin, Alan Henderson and Malcolm Haynes and the ode and prayers recited. Canon Robin Howard also recited a poem he had found displayed under the RAF commemorative window in the Church.